After a couple of years trying to follow the advice of modern medicine to prevent endometriosis from developing further in my body, and several doctors’ appointments, I decided that I had enough and would focus instead on natural ways for endometriosis healing. Maybe some women out there were luckier than me, and could get rid of theirs thanks to a pill, or surgery, but it all did not work for me and even made me feel worse. So I looked further into endometriosis, what causes it, and what is necessary to focus on to get your body back onto the right tracks. Due to my situation worsening, I had to reduce my workload and even ask for a sabbatical, which I was lucky enough to be granted. I have now been off work for 1.5 months, and this has given me plenty of time to study more the disease and the different strategies one can use to get and feel better. I for sure am not healed yet, but I feel that for the first time since my first worrying symptom appeared back in 2011, I am on the path to recovery. 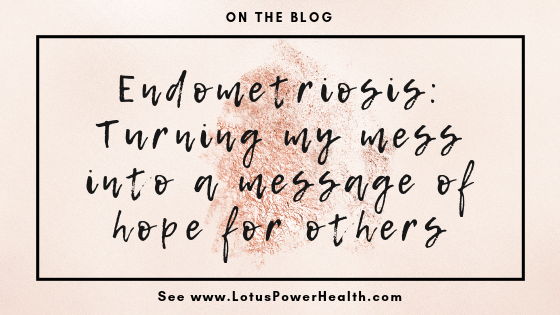 This blog is my attempt to help women with endometriosis or other hormonal issues to address their situation and improve their life before the disease takes them over, and they no longer feel like themselves. I hope anyone reading it will find what I share useful. I am happy to receive feedback, comments, topics or issues you would like me to address. To the best of my knowledge, I will share what I learnt with you. To a happy and healthy you! What a wonderful opportunity for reflection and growth! I have doing something similar to deal with my own health issues and am finding it enriching beyond expectation! So far I find that the best way to heal from any health issue is to first acknowledge it, then understand it and finally take actions and decisions towards your goal of healing. I trust that my body will lead me onto the right path to heal. This is the theory I am testing now. And, as Hussein Nishah said, my motto is: "I am too positive to be doubtful, too optimistic to be fearful and too determined to be defeated".